a ska loving geek: heres violet! ive just finished 3 busy busy days at work. so busy i got up at 11 am today! i plan to do some scrapping and sewing and should hopefully have some pics later. 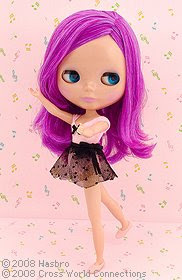 i just paid for a new doll last nite, after the last one fell thru with the aussie $$ etc...but i thought screw it, im buying a new girl cos i deserved her these past few weeks. ooh she is gorgeous, love her hair!!! !